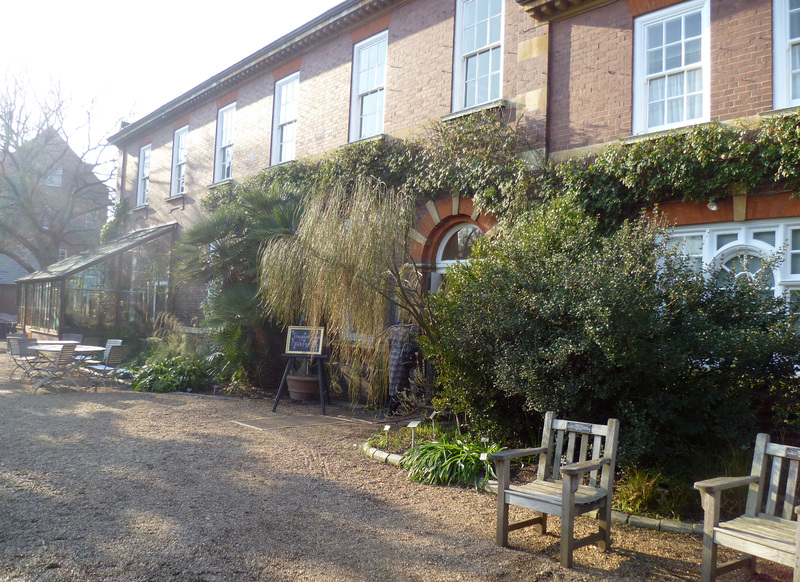 The delicious Tangerine Dream Café at the Chelsea Physic Garden. When the Chelsea Physic Garden held an afternoon of honey tasting, Emily and me went to represent the honey-eating skills of Ealing’s beekeepers. The afternoon began with a talk about honey from Peter James, or Peter the Beekeeper, who traced the trail of honey from the earliest rock paintings to the modern-day industry largely in Europe, South America and Africa. Honey has been valued for food and medicine throughout history, and more recent research suggests that manuka honey is useful against the superbug, MRSA. 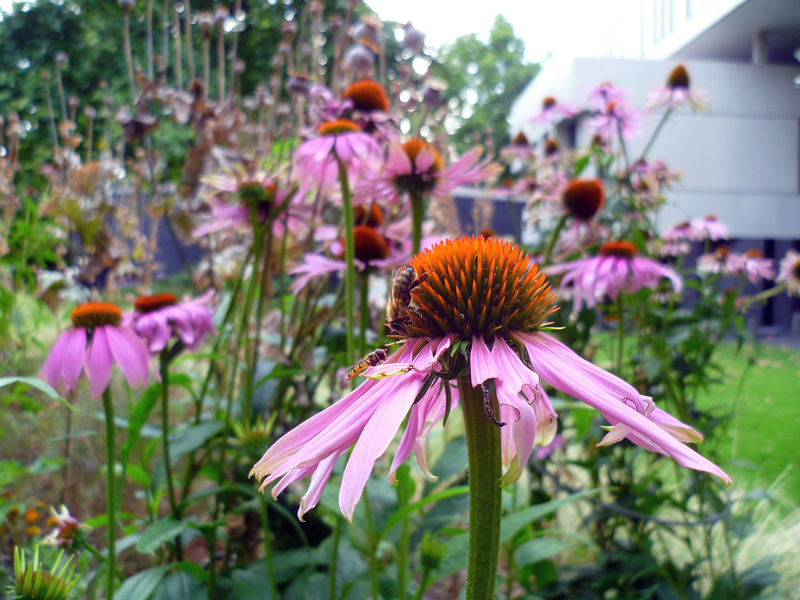 Last summer I spotted this honeybee foraging with a hoverfly on echinacea in the RCP medicinal garden. She was moving very slowly and seemed to be at the end of her lifespan. We paused to stop at a slide of a honeybee foraging on a flower. ‘Look closer and you’ll see that her wings are frayed and falling apart,’ said Peter. Honeybees have limited flying miles and spend them carrying nectar and pollen back to the hive. ‘She will work, work, work until she drops down dead,’ said Peter dramatically. Bees also use their wings to fan the nectar inside cells to evaporate its water content. When the water level is low enough the newly made honey is capped off by the bees and ready for beekeepers to harvest. The water viscosity of honey must be 20% or less because honey is hydroscopic, meaning that it attracts water. If you leave the lid off a jar of honey it will draw water from the air, and honey with high water viscosity could ferment. ‘That’s how mead was discovered, someone left the lid off the jar,’ mused Peter. Did bees introduce us to alcohol too? It’s a nice thought. Peter passed around a refractor with a drop of honey so that we could all look at the viscosity. Then it was time to taste the honey. 'Mutiny on the Bounty' honey from the Pitcairn Islands tasted dark and interesting. The first honey pot was a delicate acacia the colour of white gold and elegantly floral. Peter asked us to describe our taste experience and it was interesting how much this varied from ‘like flowers’ to ‘woody’, and even ‘Inoffensive, it didn’t taste of honey’. Next we tried a honey harvested from the lavender fields of France. It smelt and tasted like lavender, but it was also buttery and mellow with citrusy notes. Two honeys from the Chelsea Physic Garden crop showed what a difference a season makes: the spring honey was full of mint and the summer honey was bursting with ripe fruit. Chelsea’s bees have a rich diet thanks to the botanical garden’s trees and flowers. My favourite was ‘Mutiny on the Bounty’ honey from the Pitcairn Islands, which was dark in colour and complex in flavour. Its taste created a vivid image of tropical rainforests followed by layers of sweet sensations from woody, minty, caramel and toffee. Last but not least, Peter let us sample a tiny jar of South American honey foraged from Yucatan trees. It was almost black and treacly with a strong exotic flavour a bit like rum. Someone said ‘aggressive’. Home-made honey cake drizzled in honey with crème fraîche. The day was getting on and usually by three o’clock on a Saturday Ealing beekeepers are full of tea and cake. 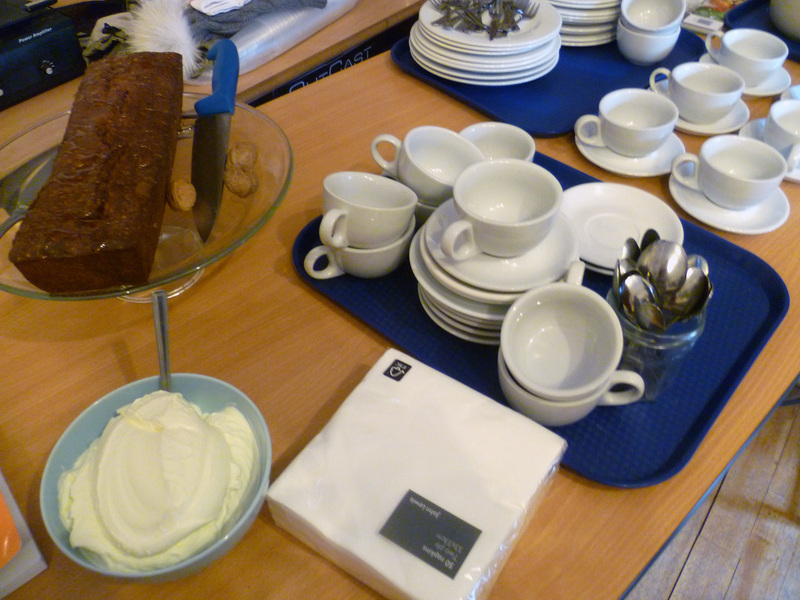 Emily and me were starting to feel a bit fidgety, but luckily Peter must have known we were coming because he had arranged a great spread of tea and honey cake with crème fraîche. 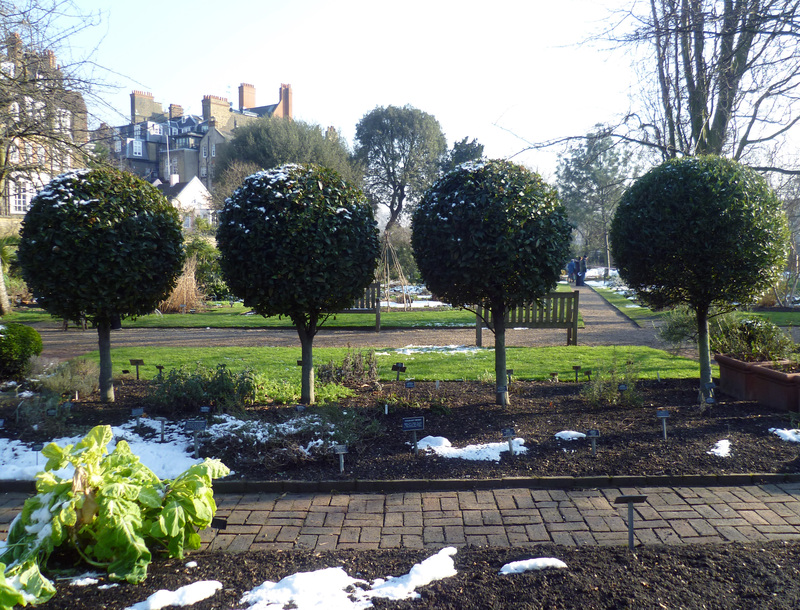 It was an afternoon well spent and though the first event of its kind, Peter said the Chelsea Physic Garden was planning to hold more honey tastings. All that honey and cake had warmed-up our appetites, so Emily and me rushed off to the garden’s Tangerine Dream Café to enjoy a spinach and cheese tart with lentil, olive and pomegranate salad. 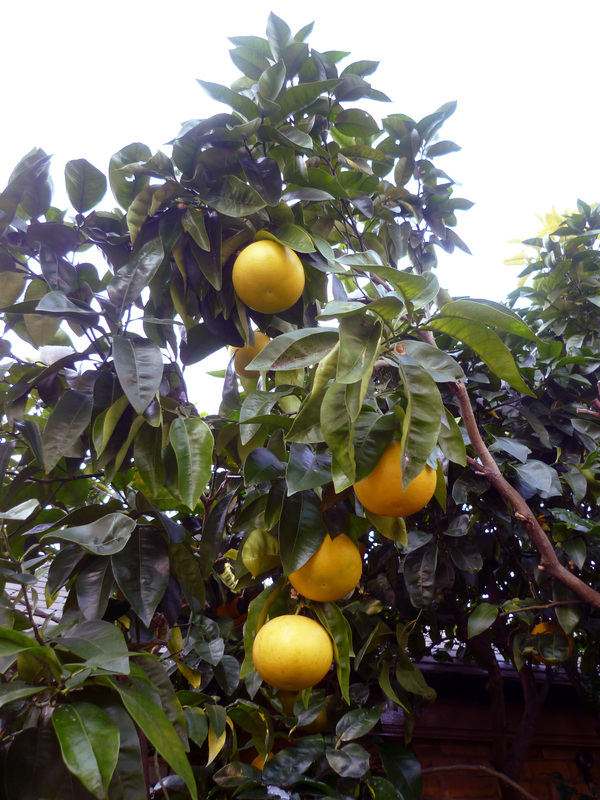 A tree full of grapefruit. It smelt lovely. 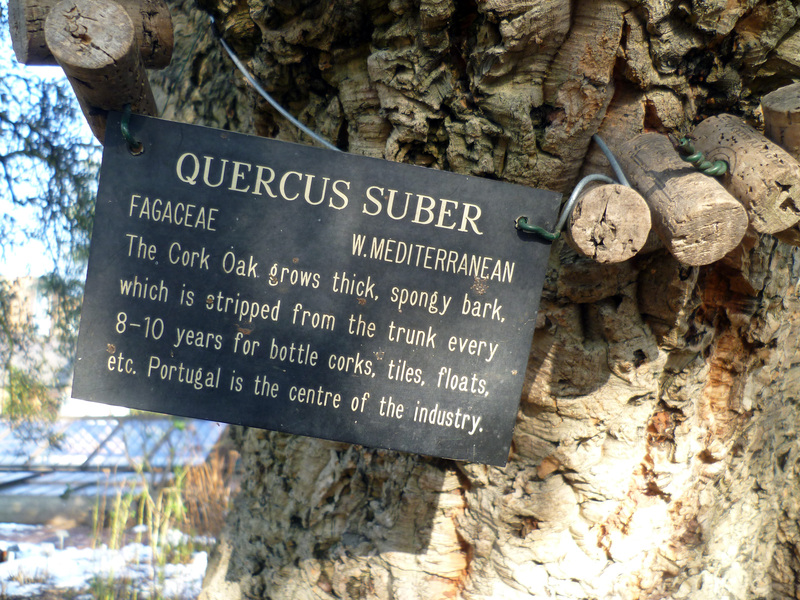 A tree made of cork. It felt spongy and warm. 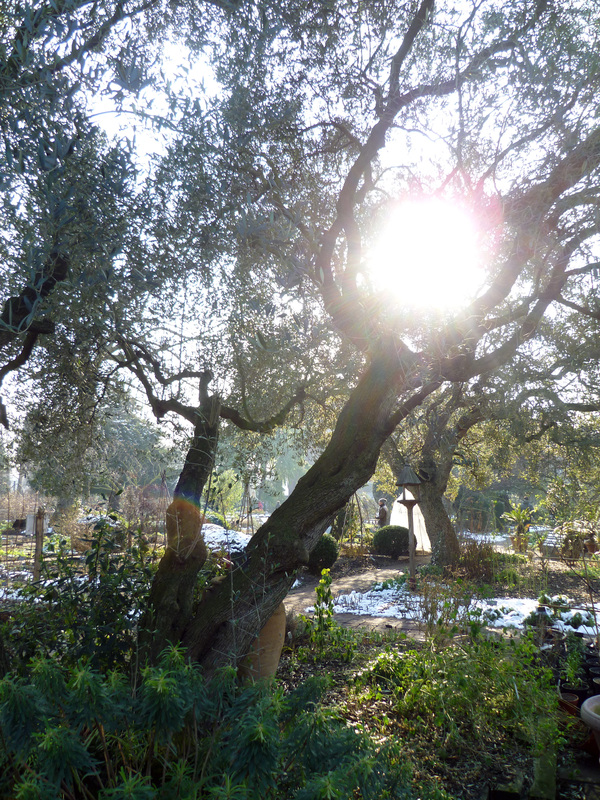 And late afternoon sunshine melting snow from branches. Last year I wrote a blog on: ‘How to extract honey‘, and you can read more about our honey exploits in ‘Hunny time‘ and ‘Bringing home the honey‘ on Emily’s blog. This entry was posted in Gardens, Honey and tagged Chelsea Physic Garden, honey, honey tasting, honeybee, Peter James by Emma Maund. Bookmark the permalink. Loved the honey tasting description! The Pitcairn honey sounded like buckwheat honey which is almost black and very viscous.It has a malty, molasses like flavor and is supposedly very high in the scale of antioxidants for wound healing. I haven’t tried buckwheat honey, but it sounds like it would be good on toast? I would like to try it for aromatherapy recipes if it is high in antioxidants. So interesting how the colour, flavour and scent of honey is true to the plant of origin. It is definitely an acquired taste. But it seems like the darker the honey, the better for you. That’s a lovely saying, I shall have to remember that. I will invite you and Emily! Since I don’t know any beekeepers and honey is soooo expensive out here, I rarely get to sample different varieties of honey. The standard honeys you buy in the supermarket are usually clover and sometimes blackberry. But I remember several years ago going to a farmer’s market and finding a table where a farm sold pumpkin honey. I had never had it, so asked to try a sample (since they were offering them). But based on that experience, I certainly would find going to a honey tasting something interesting and worthwhile! Pumpkin honey! I love pumpkin soup, pie, everything – can only imagine how gorgeous it must have been. I do hope you can find pumpkin honey again. If you do, I would be interested to see pictures. What colour was it? Did you cook with it? Honey is pretty expensive here too, so lucky we know the bees! It is so precious though – it takes one bee a lifetime to collect one teaspoonful of honey, so I try not to lose a single drop. The honey tasting was a great idea because we got to taste lots of honeys that would have cost a fortune to try otherwise. Color wise, it was a darker amber or burnt sienna color. In the picture of the honeys you have above, the jar with the yellow lid probably comes close. I wonder what the properties of pumpkin honey are, because pumpkins are high in vitamin A and mashed up make great face masks. If I ever see pumpkin honey myself, you’ll be the first to know! Beautiful post Emma, brings back memories of the day! We had a mini honey and mead tasting at the Walworth Garden Farm cooking with honey course I went on, discovered I really like lime blossom honey! Wonder how many more honey tasting sessions I can fit in this year. This week I’ve been eating strawberries with vanilla extract and our honey poured over the top. Honeybees are a required part of the natural life of flowers. Here, they are so scarce that the Mason Bees are taking over the job they once did. I like your post and the story with the pictures. Such a shame that honeybees, and other bees, have become so scarce in certain areas. I hope they can find a way to come back – no bees, no flowers and no honey! I don’t know much about mason bees, or solitary bees, but they sound fascinating and would love to know more. Yum, a honey tasting. Sounds like a delicious afternoon. We love Manuka honey in our house and at the slightest hint of a sore throat or cough, out comes the spoon! Love your Echinacea photo too. You have a sensible household! Manuka honey is also lovely in echinacea petal tea, very good for getting rid of colds. There are a lot of interesting research papers on PubMed about manuka honey for wound dressings and for fighting bacteria and viruses. This post brought back a memory of trying lavender honey when I was in France about 18 months ago. I would have liked to bring a jar back with me but I was wary of the quaratine laws here and thought that it may be confiscated. I think there is a restriction on bee products entering the country. However, it awakened something in me re: honey and I searched for a honey I loved many years ago and had not found for a long time. I only recently came across it out west where my family live – stringybark (a type of eucalypt). Now I always keep a supply and especially adore it when it crystalises. I was also interested in your reference to Manuka honey – I found this years ago when staying with my cousin who lives across the “ditch” in New Zealand. That was when I found out about the anti-bacterial properties of honey and the UMF of Makuka. Further research has found that the Jarrah tree (Eucalyptus marginata) in Western Australia has special antimicrobial properties as well. 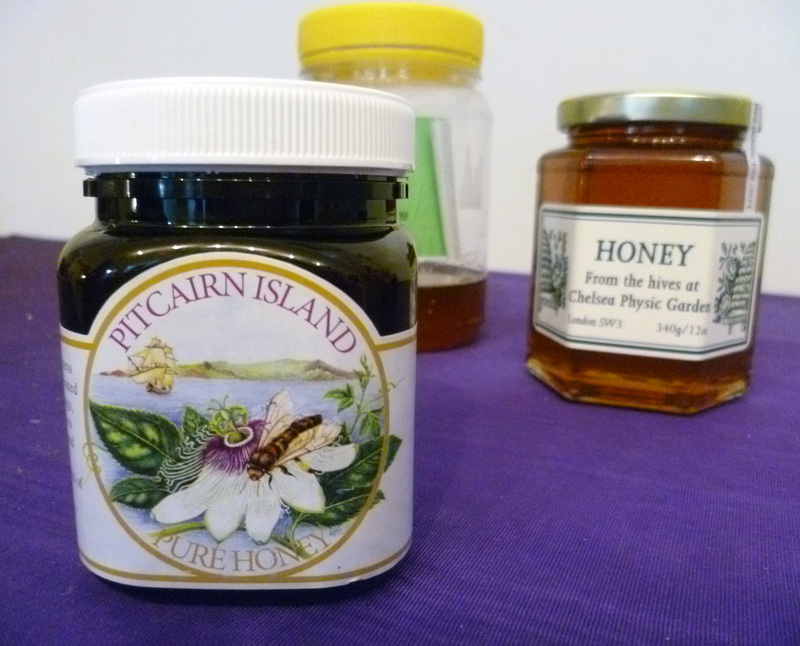 I will keep an eye out for the Pitcairn Island honey. It’s true that transporting honey between countries may help the spread of bee diseases, because the microorganisms in honey though harmless to humans can prove fatal to bees. The idea being that if you leave a jar of honey open near a window, a bee might land and feed on it, then take the honey and harmful microorganisms back to its colony. With honeybee numbers declining, better to be safe than sorry, I guess! But the lavender honey you discovered sounds divine. Which region in France did you visit? Honey is delicious when it crystallises, and cut comb is gorgeous. I used Manuka honey to great effect several years ago when I was having lots of stomach problems, feeling nauseous etc and the doctors couldn’t find a reason. After a few months I started to feel much better. Re: lavender honey – I had never tasted honey like that before and it was in the south west. I was at a yoga and hiking retreat staying in a country chateau and I think the closest town was Pau. It sounds like you had a wonderful time. I’ve never been to a honey tasting but would really like to do so. I actually found your site when doing a search on Pitcairn Island honey, which I fell in love with the instant I first tried it… it’s like ambrosia, as I’m sure you well recall. 🙂 I enjoy it so much that I decided to open a little sideline business. Because Pitcairn is so remote, ordering it directly from the islands takes several months. I buy it in bulk from Pitcairn and resell it for a few extra dollars to those who are willing to pay extra to avoid the wait. It will never be a big deal since Pitcarin’s production is so small — not much more than a hobby, really. But I’ve been having a wonderful time introducing other people to the honey! All good things come in little packages like bees and the best honey. If it wasn’t so rare it wouldn’t be a treasure. I’m glad Pitcairn brought you to my blog, it was certainly an experience to taste the nectar from the bees of this mysterious island.